Over the weekend I finished the first of my log cabin projects, a necktie for my DH. 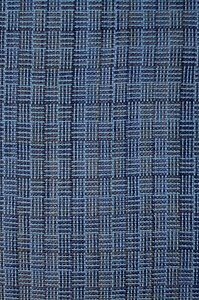 This is the fabric you saw on the loom in my “Log Cabin Project” entry for May 5th. I wove the fabric with 16/2s cotton, sett at 30 epi in order to get a fairly firm fabric for a necktie. I used McCall’s pattern 9469. This is the first time I’ve sewn with my handwoven, and I had to deal with several concerns. My first was that I couldn’t weave fabric wide enough to cut the tie on the bias, as the pattern called for. My second concern was building up the nerve to put the scissors to it! Regarding the fabric width, I decided to press on and cut out the pieces lengthwise. I know this goes against conventional sewing wisdom, but in weighing out the possibility of no tie versus a tie not cut on the bias, I went with making the tie the best I could. Regarding working up the nerve to cut into my handwoven fabric for the first time, well I relied on the support of several of my weaving friends! I was relieved to discover that it didn’t immediately unravel, but with careful handling behaved nicely until I could stabilize the edges with a straight stitch around the pieces. The only other thing I decided not to do in regards to the pattern instructions, was to sew right sides together and turn through a small opening left in the seam. I didn't want to put any extra pull or wear on my fabric, so I simply folded the edges and hand sewed the seam. DH was pleased to be presented with a tie made to his specifications in a pattern and colors he likes, and I’m just happy that it turned out so well! Congratulations! It's a beautiul tie. Now that you know you can sew your handwovens, what other projects are cooking in your head? And welcome to the Spinning Wheel!